Let's face it, the Internet is an essential tool for just about every business these days. Even the smallest of companies rely on it for email communication, on-line ordering and gathering information. It is a simple fact that a business cannot survive if it does not have access to the Internet. But the problem is, there are so many different types of Internet services, and many Internet Service Providers (ISP's), all of whom have their own variations on what is available. Terms and Conditions can also vary widely between ISP's and are often worded in such a way that they are not always that easy to understand. Over the years we have seen all sorts of offerings, from dial-up, ISDN, ADSL, ADSL2+, 21CN, LLU, SDSL, EFM, Leased Line, FTTC, Infinity, EoFTTC, FTTP, MLLP, Bonded Internet to name but a few. So how does a business go about choosing the right product and ISP from this many and varied list of options? This is simple really - what do you use the Internet for? These days, many companies are using it for so much more than web browsing and email. Many are moving their entire IT infrastructure into the 'cloud', which means that the emails systems become hosted, documents and data are stored off-site and remote working is now commonplace. In fact, many companies are now using their Internet connections to run their telephony over it using VoIP technology, instead of the more expensive and traditional methods. An Internet connection is typically a shared resource, so the more people that are using it, either the slower it becomes or conversely, the faster it needs to be in the first place. A slow connection shared by many people can become unusable, whereas a fast connection shared by a few is probably overkill and is costing a company more than it should. How Important Is The Upload Speed? With many of the cheaper Internet connections, the upload speed is often far slower than the download speed, but a lot of people don't realise this and it becomes their downfall if they, as a business, need to upload content to the cloud. It is important to not only consider how you use the internet right now, but also how you might use it in the future. There are a lot of emerging technologies out there and many companies are taking advantage of the 'cloud', VoIP and remote working. It is important to have a basic knowledge of these technologies and how they can potentially improve the efficiency of how you work. Furthermore, this may in turn influence your Internet connection requirements. Do You Have More Than One Office? If you have more than one office, and it makes better sense to make all of the office locations part of one network, then many companies will have just one big internet connection at one of the sites and then link the others back to this site using point to point services. This means that the satellite sites connectivity is routed through the main site and is often a far more cost effective and neat way of delivering a solution. 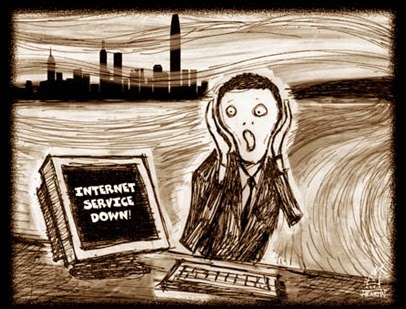 How Much Will It Cost Your Business If You Lost The Internet For A Day? This is key as for some; it would really matter in the grand scheme of things. Companies who rely on the Internet for order processing, communication, remote working, Cloud services, e-commerce to name but a few could all suffer serious financial consequences if they were suddenly left without their Internet connection for a day. Therefore, they need to invest in the Rolls Royce of Internet connectivity and even have a disaster recovery option in a backup service. As a business, we accept that not everyone would be able to answer all of these questions before deciding on which product or ISP they choose to provide their connectivity, but that is what we at CCS are here for. Our sales team are committed to giving out the best advice for your business requirements, and we're proud that our reputation is built on giving good advice. If you do need any help with any of the above then please do not hesitate to give our technical sales team a call on 0113 294 6699. It is now just over 2 weeks since we were officially accpeted as being an approved supplier for the Superconnected Cities voucher scheme and we're pleased to say that the orders are now coming and and are being approved. One thing which we are particulary impressed with is the speed and efficiency in how this happens. So all in all, the whole process took less than 24 hours, and was very straightforward. If you have been thinking about upgrading your internet connectivity, but have previously been put off by the high installation and run costs, then why not check to see if you're eligibly for the voucher scheme and then get in touch? We're always happy to help. We are pleased to announce that CCS (Leeds) Limited have now been accepted as an official supplier of Internet services to businesses who qualify for the government ‘Connection Voucher’ scheme. Would your business benefit from faster, better broadband? Would you invest in a faster, better broadband connection if someone gave you money towards the cost? Would up to £3,000 interest you? In a nutshell, you may qualify for a FREE broadband Connection Voucher up to the value of £3,000 to cover your upfront connection costs. Please note that to date, 100% of our customers who have applied for the voucher, have been approved! In an update to our VoIP platform late last week, I am pleased to advise our VoIP customers will now be able to call the following short code numbers. a. 101 - This is the police none emergency number and replaces the "reception desk" number previously used to contact your local police station. Calls are handled by a semi-automated system and you are asked for the name or area of the local police force upon calling it and are then transferred. b. 111 - This is the NHS "none emergency" number. The NHS quote "You can call 111 when you need medical help fast but it’s not a 999 emergency. NHS 111 is a fast and easy way to get the right help, whatever the time" Once again there is a semi-automated call directing service when you call. d. 999 - This of course is the traditional UK emergency services number. Calls are handled by various call centres around the country and you should expect to be asked for your full address when you call as VoIP calls are of course not necessarily in a a fixed location, despite what the address details recorded against the number may imply. All calls to 999 are specifically tagged as location agnostic to ensure the location is requested in the call. Despite the fact 101 calls are chargeable (to us by the terminating telco) we at C.C.S. deem all emergency services calls are important and therefore will not be charging for connection or time spent on the phone for any of these numbers. They are all completely free of charge. A particularly nasty Ransom-ware Trojan called CryptoLocker which first surfaced in September 2013 has become a serious threat once again. The ransom-ware is entering peoples email inbox's appearing to be a scanned fax. The attachment is a zipped folder and if opened it will cause serious and potentially unrecoverable damage to your IT system and data. The safest option is that if you receive any emails contain the word FAX in the subject header with a zip file attached please do NOT open it. The ransom-ware is activated by the user when they click to open the attachment and in some flavour a countdown timer or Red X will appear on the screen with a message saying your data is being encrypted. You will then be presented with the option to pay a ransom to get your data back; even if you pay the ransom your data will not be decrypted! This ransom-ware is a real threat and if your system becomes infected there is no way to decrypt your files and you will lose everything unless a backup has been made! As the ransom-ware is arriving by email we strongly urge you to be aware of your emails and be careful when opening attachments if they are not from a source you regularly receiving emails with attachments from. We urge all users to be incredibly vigilant when opening all attachments and if your Anti-Virus protection says that an email or the attachment may include malicious items giving you the option to open it or not please do not open it! Here at C.C.S. we are about to introduce Direct Debit as an accepted method of payment. After endless requests from our customers, we are almost ready to start offering the most reliable and trusted instant payment method in the UK. The advantages of Direct Debits are, quite possibly, unprecedented and unmatched. Firstly, they are guaranteed, which provides huge peace of mind and reassurance. Your money is protected by some very reliable safe guards, including an immediate money back guarantee from your bank in the event of an error. Of course, Before your Direct Debit is taken from your account, you will receive a customized invoice, listing all of your products/services, and noting a payment date for the Direct Debit collection. You will also receive an email, three days before the Direct Debit is collected, as a reminder of the collection date. Direct Debits are also the fastest and most effective way to pay. You can ensure that your payments are made, in full and on time, without any of the hassle that comes with cheques or bank transfers. Even better than that, late payment charges can't possibly be incurred as the payments are automatic! Anything which means payments can't be forgotten or delayed will, undoubtedly, make any life easier. Finally, Direct Debits can also save you heaps of time. Here at C.C.S., we understand that all of our customers lives are, more than likely, busy and hectic enough. Direct Debits take away the inconvenience of having to waste time, logging onto your Online Banking or setting up a BAC's transfer. We hope that our new Direct Debit option can provide our customers with plenty of saved time and peace of mind.